I have subdomain.example.com that I use for development purposes. My web application solution contains a web API etc, that I need to call from external systems, hence I am not using localhost. I now need to test for SSL and need a certificate for my subdomain.example.com development domain name. I have tried creating a self-signed certificate as outlined in http://technet.microsoft.com/en-us/library/cc753127(v=ws.10).aspx, but this certificate only works for localhost. Can this certificate be used for my purpose or will I have to create a self-signed for my development subdomain? If I have to create a self-signed certification for my development subdomain, what utility or online service (Free) can I use for this? Am adding this info because the accepted answer does not seem to address the question fully, or at least didn't solve the problem for me. 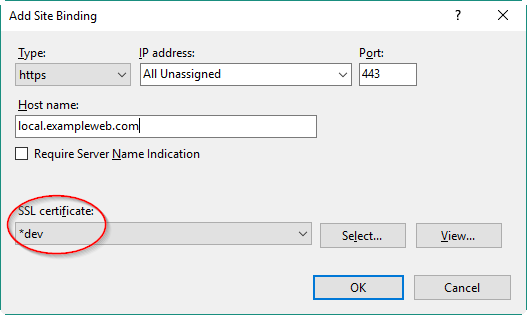 With IIS's self-signed certificate feature, you cannot set the common name (CN) for the certificate, and therefore cannot create a certificate bound to your choice of subdomain. Your certificate should then appear in IIS Manager to be bound to your site as explained in Tom Hall's post. Where it says "Specify a friendly name for the certificate" type in an appropriate name for reference. Click OK and test it out. I had to puzzle my way through self-signed certificates on Windows by combining bits and pieces from the given answers and further resources. Here is my own (and hopefully complete) walk-through. Hope it will spare you some of my own painful learning curve. It also contains infos on related topics that will pop up sooner or later when you create your own certs. Don't use makecert.exe. It has been deprecated by Microsoft. The modern way uses a Powershell command. In Powershell on these systems the parameters -FriendlyName and -NotAfter do not exist. Simply remove them from the above command line. Both of the above commands create a certificate for the domains localhost and *.dev.local. The Win10 version additionally has a live time of 15 years and a readable display name of "Dev Cert *.dev.local, dev.local, localhost". After creation the cert will be immediately available in any HTTPS bindings of IIS (instructions below). In left column choose "Certificates (Local Computer) / Personal / Certificates". Find the newly created cert (in Win 10 the column "Friendly name" may help). Right-click this cert → All Tasks → Export... → Next → choose "No, do not export the private key" → Next → choose "DER encoded..." → Next → enter file name and save. Hint: We deliberately don't use the PFX file format for export. It would include your private key into the export file and you usually don't want your private key to go anywhere! In left column right-click on "Certificates (Local Computer) / Trusted Root CAs / Certificates" → All Tasks → Import... → Next → choose the file that you just exported → Next → "Place all certificates in the following store: Trusted Root CAs" → Next → Finish. Now you may go to IIS Manager, select the bindings of a local website → Add → https → enter a host name of the form myname.dev.local (your cert is only valid for *.dev.local) and select the new certificate → OK.
Now Chrome and IE should treat the certificate as trustworthy and load your website when you open up https://myname.dev.local. Firefox maintains its own certificate store. To add your cert here, you must open your website in FF and add it to the exceptions when FF warns you about the certificate. For Edge browser there may be more action needed (see further down). Firefox uses its own SSL cache, which is purged on shift-reload. So any changes to the certs of your local websites will reflect immediately in the warnings of FF, while other browsers may need a restart or a manual purging of the windows SSL cache. This warning is correct! As noted above, Firefox does not use the Windows certificate store and will only trust this certificate, if you add an exception for it. The button to do this is right below the warnings. This warning shows, that you did something wrong. The (wildcard) domain of your certificate does not match the domain of your website. The problem must be solved by either changing your website's (sub-)domain or by issuing a new certificate that matches. In fact you could add an exception in FF even if the cert does not match, but you would never get a green padlock symbol in Chrome with such a combination. Firefox can display many other nice and understandable cert warnings at this place, like expired certs, certs with outdated signing algorithms, etc. I found no other browser that gave me that level of feedback to nail down any problems. Which (sub-)domain pattern should I choose to develop? In the above New-SelfSignedCertificate command we used the wildcard domain *.dev.local. You may think: Why not use *.local? Simple reason: It is illegal as a wildcard domain. Wildcard certificates must contain at least a second level domain name. So, domains of the form *.local are nice to develop HTTP websites. But not so much for HTTPS, because you would be forced to issue a new matching certificate for each new project that you start. Valid host domains may ONLY contain letters a trough z, digits, hyphens and dots. No underscores allowed! Some browsers are really picky about this detail and can give you a hard time when they stubbornly refuse to match your domain motör_head.dev.local to your wildcard pattern *.dev.local. They will comply when you switch to motoer-head.dev.local. A wildcard in a certificate will only match ONE label (= section between two dots) in a domain, never more. *.dev.local matches myname.dev.local but NOT other.myname.dev.local! Multi level wildcards (*. *.dev.local) are NOT possible in certificates. So other.myname.dev.local can only be covered by a wildcard of the form *.myname.dev.local. As a result, it is best not to use a forth level domain part. Put all your variations into the third level part. This way you will get along with a single certificate for all your dev sites. After following the above steps, Edge may not show any content when you open up myname.dev.local. The reason is a characteristic feature of the network management of Windows 10 for Modern Apps, called "Network Isolation". I ran into this same problem when I wanted to enable SSL to a project hosted on IIS 8. Finally the tool I used was OpenSSL, after many days fighting with makecert commands.The certificate is generated in Debian, but I could import it seamlessly into IIS 7 and 8. Download the OpenSSL compatible with your OS and this configuration file. Set the configuration file as default configuration of OpenSSL. First we will generate the private key and certificate of Certification Authority (CA). This certificate is to sign the certificate request (CSR). You must complete all fields that are required in this process. You can create a configuration file with default settings like this: Now we will generate the certificate request, which is the file that is sent to the Certification Authorities. The Common Name must be set the domain of your site, for example: public.organization.com. Now the certificate request is signed with the generated CA certificate. The generated certificate must be exported to a .pfx file that can be imported into the IIS. openssl pkcs12 -export -out server-cert.pfx -inkey server-key.pem -in server-cert.pem -certfile root-cacert.pem -name "Self Signed Server Certificate"
In this step we will import the certificate CA. In your server must import the CA certificate to the Trusted Root Certification Authorities, for IIS can trust the certificate to be imported. Remember that the certificate to be imported into the IIS, has been signed with the certificate of the CA. Open Command Prompt and type mmc. Select Computer Account and Next ->. Select Local Computer and Finish. You must select All Files to browse the location of root-cacert.pem file. 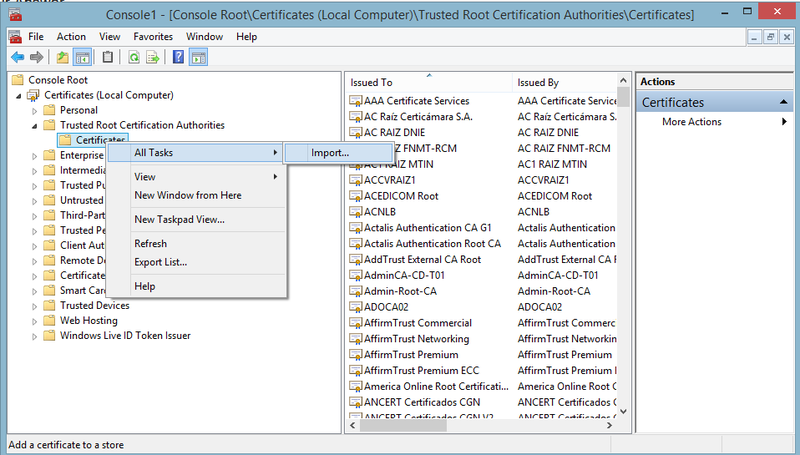 Click on Next and select Place all certificates in the following store: Trusted Root Certification Authorities. With this step, the IIS trust on the authenticity of our certificate. In our last step we will import the certificate to IIS and add the binding site. Open Internet Information Services (IIS) Manager or type inetmgr on command prompt and go to Server Certificates. Set the path of .pfx file, the passphrase and Select certificate store on Web Hosting. Now go to your site on IIS Manager and select Bindings... and Add a new binding. Select https as the type of binding and you should be able to see the imported certificate. Click on OK and all is done. Another option is to create a self-signed certificate that allows you to specify the domain name per website. This means you can use it across many domain names. Once selected, the domain name box will become enabled and you'll be able to input your domain name. Under Actions panel, click “Generate Self-Signed Certificate...” menu item. Not the answer you're looking for? Browse other questions tagged iis ssl certificate ssl-certificate self-signed or ask your own question. How to create a self-signed certificate with .pfx and .cer files? Can you use a service worker with a self-signed certificate?